Triple Money Match – Scratch for Cash! More fun, more winning opportunities and the average chance of 1-in-3 scratch cards being a winner! You already know or at least heard that Winnings.com is one of the leading online gaming sites that was founded by online scratch cards enthusiast for the lovers of virtual scratch-off tickets! Now there’s yet another online scratch card available to be played and won – Triple Money Match! Triple Money Match might just look like the usual scratch-off ticket, but it’s not! This online scratch card game provides 3-times pure scratch-off excitement. It’s nearly impossible not to fall in love with this simple but yet entertaining & rewarding scratchcard. The game itself was developed by NeoGames, one of the world’s leaders in online gaming entertainment. It’s so simple to play but the sheer excitement in revealing one scratch area after another, comparing the symbols and cashing in… amazing! Triple your money; triple your fun, that’s what this game is really all about. Yes, the game is just like any other classic scratch card game that does allow you to win up to three cards any time. What really makes this online scratch-card a charming one is its simplicity. Players can cash in by revealing three matching symbols and here’s the thing… the prizes are increased every time with the scratch-ticket’s multiplier. Inspired by traditional scratch-off tickets, this particular one is easy to play and provides more than just ample winning opportunities. You can play up to three games at a time in order to maximize your changes in cashing in big time. Wagering starts from just £0.10 per round and raising your stakes could enable you to win a jackpot worth a whopping £200,000! 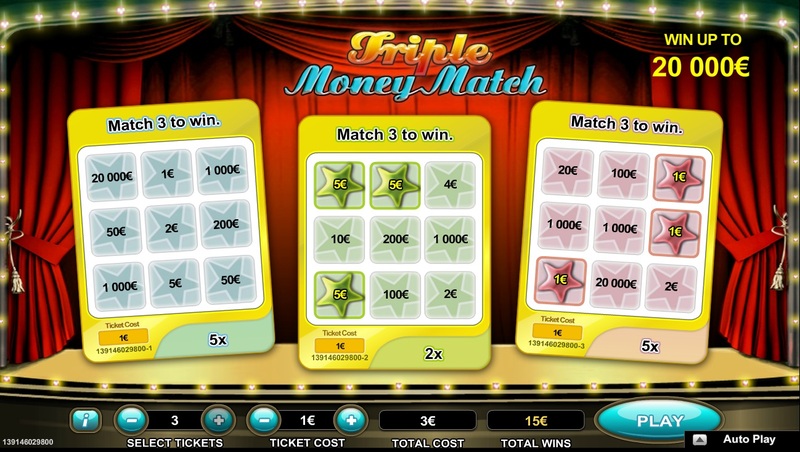 Some of the features of Triple Money Match are, while in Fun or Demo Play-Mode to switch to the Real Money mode, the Chat button to contact customer service, the Balance button to check the current amount of funds available for playing the game. The Quick deposit button allows the players to fund they account immediately whereas the Back to Lobby button brings you… well, back to the Main Lobby. In order to check and adjust the game options, click the Menu button for the settings. In order to access the game instructions, simply click the ‘?’ button. Don’t like the sound, simply mute/un-mute with the help of the Sound button. This online scratch card is suitable for casual gamers, low-rollers and high-rollers alike, too. Wagering and betting option are as follows- £0.10, £0.25, £0.50, £1, £2, £5 and £10. As already mentioned, there are multipliers that determine the winnings. The maximum multiplier has a value of 20,000X, so with a wager of £10 you can win the mega-jackpot worth £200,000! At first glance Triple Money Match might not appear as ‘too exciting’. I do second this motion, I do. There are no special bonus rounds, video sequences or animations, but that’s not really the point. Online scratch cards in general are for those of us who want to experience sheer excitement and the thrill of revealing scratch-off tickets. The advantage of all kinds of scratch card games at Winnings is that 30% of all scratch cards are winning tickets. In order to maximize the fun and the winning opportunities I personally recommend budgeting your monies and instead of buying one scratch-off ticket for let’s saying £10, buying 40 worth £0.25 each. More online scratchies, more winning opportunities and the prizes sum up at the end. Grab your free scratch cards, if applicable, while signing up at Winnings.com and also take advantage of the 1st deposit bonus offer as well.